The Gauntlet series has always been one that was made for co-op. Without a group of friends on your couch or at the arcade with you, the experience just wasn’t the same. Running through dungeon after dungeon, collecting gold and chugging forward gets old fast if there’s no one there to share the adventures with. While Gauntlet: Slayer Edition does its best to pay homage to the beloved series, it stumbles a bit with repetition and the dreaded grind that no action-RPG player wants to experience. Gauntlet: Slayer Edition looks like a typical Gauntlet title from the start. You’ve got your quartet of heroes, plus a necromancer available as DLC, and you’ve got a dungeon that needs conquering. Each of the characters has a different play style and each character can be upgraded with new weapons, armor, and runes that unlock new abilities to customize the character even more to your play style, at least in theory. While the main characters definitely play differently and offer up varied styles to test as you play, I felt that the weapons and runes did little to vary my gameplay experience. Sure, my different warrior weapons gave me different special attacks, but some of them seemed useless and in the end my generic weapon’s whirlwind seemed the best option both in single player and co-op. 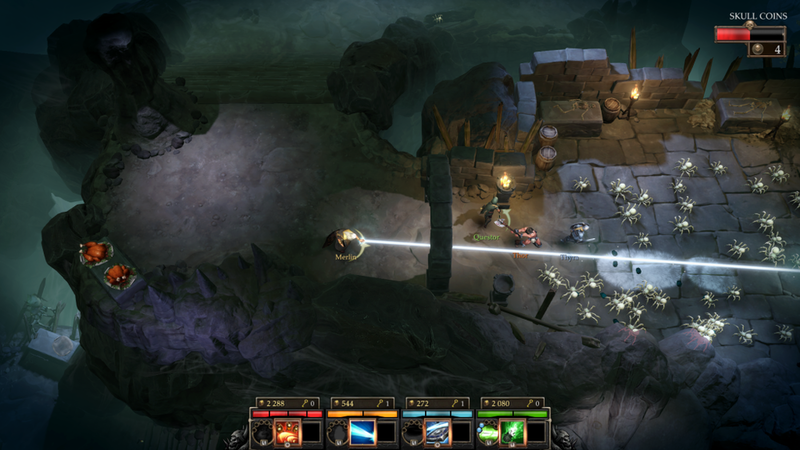 Gameplay in Gauntlet is simplistic, with an attack button and two special moves. As stated before, these special moves vary depending on runes and weapons but they’re usually the moves that everyone will use as soon as they’re off of cool down. With my warrior, I felt that a large portion of the game was spent running away from enemies, waiting for my whirlwind and speed boost to pop, and going back into the fray and doing that on repeat. The warrior is certainly the easiest class to play, and while all four classes offer different styles, the wizard felt like the most difficult of the bunch. With the class’s steep learning curve and almost no one playing it online, I didn’t see what the draw was of the class or why it hasn’t been updated. There is something to be said for a well-balanced team online or in co-op modes and how well that team can function, but when one class feels weaker than the rest you seem to get a lot of warriors and Valkyries, or at least I did. Gold is everything in Gauntlet as it is the way you upgrade armor, skills and weapons. Levels can sometimes feel like a grind for gold that ends up not paying off in any meaningful way. Levels in Gauntlet are randomly generated but follow a similar format nonetheless. They generally feel like enemy-filled mazes with a few rooms that are inescapable until all of the enemies are killed. While there are a few different enemy types in the game, I didn’t feel like I needed to switch up my strategy too much between any of them. This is especially true online when there is so much damage being done that enemy type rarely matters. As you kill all of these enemies you gain gold from pickups and that’s one of the issues I had with Gauntlet. I realize that each person has their own sense of what’s useful and what’s not, but there were times where I saved up gold only to use it on an item I found utterly useless. For such a high asking price the payoff on the warrior’s final weapon, it just isn’t worth it, as it gives you a taunt which could work well in multiplayer but I never found a great use for it as enemies died too quickly for it to be useful. These types of moments make second-guessing items common, and not knowing if an expensive item will be useful is a terrible feeling to instill in a game that is all about kill, buy, repeat. Gauntlet looks alright for today’s expectations but its nothing particularly special. While it’s nice that character models change based on equipment and weapons, you can’t really see the differences due to the distant camera and tiny character models, not to mention all the on-screen chaos. Additional capes can be unlocked via the Coliseum mode, one of the new modes for the Slayer Edition. Another new mode includes an endless mode, which is basically a kill-or-die mode. It offers some nice choice-making moments as you have to pick whether to spend money on healing, spells or keep your gold and risk dying or a bigger payday in the end. While the different modes are nice, Gauntlet ultimately suffers from a huge repetition problem. Every level in Gauntlet feels like the same thing over and over again. Since the combat, while completely passable, isn’t anything special you often feel like you’re pressing the same two buttons and using little to no new strategies to win, get more gold, and do it all over again. That endless grind of getting gold and pushing forwards culminates in a campaign mode that offers no real payoff and doesn’t feel so great that a second playthrough is warranted. While it could be interesting to play the first few levels with a new character, I doubt playing the entire campaign with a new character is really worth it. Gauntlet: Slayer Edition is a passable action-RPG for those desperately looking for a dungeon crawler to play with friends but it doesn’t offer much in the way of replayability or unique concepts to really recommend past that.